Most of you are most likely familiar with the Asus ZenFone 2, but some of you might not have heard about the Deluxe edition of the smartphone. The Asus ZenFone 2 Deluxe is now up for presale over at Everbuying for $270 unlocked, and while it’s not different than the main model, it does have a different style, which most of ou will like. The Deluxe edition of the Asus ZenFone 2 comes with a mosaic back panel in blue and lilac colors, with a texture that you won’t find on any other smartphone out there right now. Although similar to the LG G4, the Asus ZenFone 2 Deluxe is definitely its own master of disguise and design with that panel. Specs and features of the Deluxe variant are all the same as with the standard variants available of the phone, but unlike those, the Deluxe edition is only available with 4 GB RAM and 32 GB ROM, so there’s not lesser endowed model that one might want to choose to save a few bucks. Nonetheless, the Asus ZenFone 2 Deluxe is definitely the best looking of all the variants that Asus put out so far, so it’s worth a look at least. 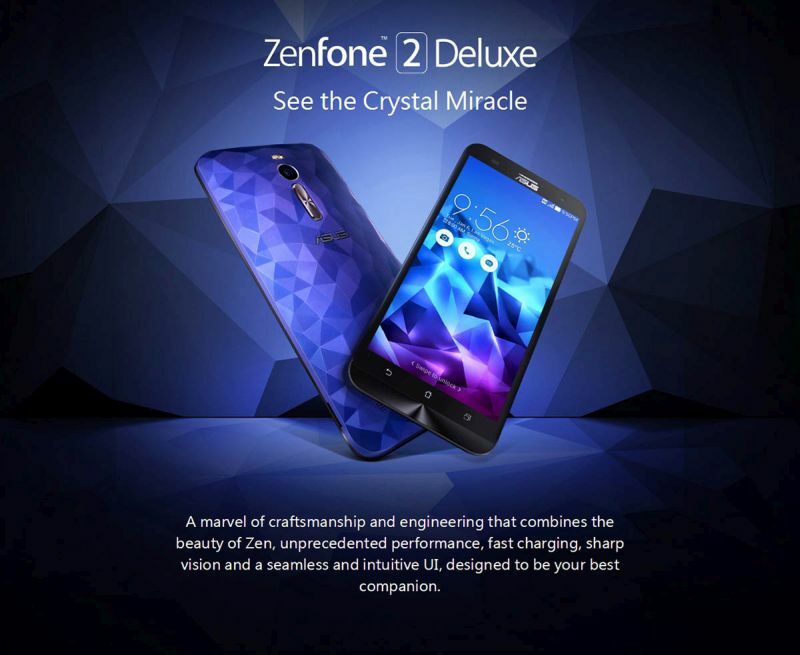 If you’re not familiar with the specs of the Asus ZenFone 2, here’s a quick rundown of the most important features that make this handset a crowd favorite and a success for the company. On the front, the phone comes with a 5.5-inch display that has a 1080*1920 resolution. Under the hood, there’s an Intel 7262 CPU running the show backed by 4 GB RAM and 32 GB expandable internal storage. When it comes to camera, the Asus ZenFone 2 Deluxe does a good job with its 13 MP dual-LED camera on the rear and a 5 MP wide-angle camera on the front. The 3000 mAh battery under the hood should be enough for most average users. The Asus ZenFone 2 Deluxe is a marvel of design and it’s definitely worth checking out, just to at least look at the cones and shapes that make up the new back panel of the device and give it a texture that not other phone has at this time. Would you buy it or would the regular ZenFone 2 suit you better?